The conflict in Northern Ireland can be traced back to the 17th century, when the English monarchy attempted to anglicise the nation. Up until this point the island had remained Gaelic Irish for the most part, despite the invasion of Vikings, Normans and English. Over time, English Protestants and Scottish Presbyterians colonised the northern counties of Ireland – commonly known as the Plantation of Ulster. Relations between the Catholic Gaelic tenants and the new landlords were hostile, and many turbulent years followed. In 1921, Northern Ireland, which is comprised of six counties, was declared one of the four countries of the United Kingdom. Ireland was officially a divided island. During the late 1960’s the Catholic minority formed a civil rights movement in response to the systemic discrimination they had faced for many decades. The failure of Northern Ireland’s Parliament to address the multitude of social issues, exacerbated the underlying mistrust and escalating tensions. The protestors’ demands were clear – they wanted equal voting rights and a just electoral system, as well as fair employment, education and public housing opportunities. The peaceful marches that followed quickly spiralled into violence that would shape and define the country to this present day. The Northern Ireland conflict, “The Troubles”, was a complex and bloody thirty-year period, arising from political and inter-communal differences. Earlier this year, I attended a course at Queen’s University Belfast (QUB) in the Senator George J. Mitchell Institute for Global Peace, Security and Justice. The programme focused on the experiences and lessons of conflict transformation in Northern Ireland. I work for Generations For Peace (GFP), a global non-profit peace-building organisation dedicated to sustainable conflict transformation at the grassroots. GFP empowers youth to lead and cascade change in communities experiencing different forms of conflict and violence, through the use of sport, arts, advocacy, dialogue and empowerment activities. GFP volunteer leaders of youth implement programmes across Africa, Asia, Europe and the Middle East. My role as Communications Officer is to create compelling human stories, both written and visual, to convey programme impact and personal change. The volunteers and programme participants I meet are dedicated to strengthening their local communities’ capacity to respond peacefully to episodes of violence, but against divided and sensitive backdrops, their job is far from easy. My particular focus is providing a means through which to amplify their narratives. So where does Northern Ireland, or more specifically, QUB, fit in? Well, as a Dublin native I grew up in the knowledge of the conflict in Northern Ireland, but like many from my generation, awareness mostly stemmed from family discussions rather than formal education. Similarly, over the years my studies and work have focused on global development challenges and peace building yet Northern Ireland has never featured heavily, which leads me to today. I was curious to learn more about a neighbouring country that is now deemed to be in a post-conflict phase. Some of my immediate questions related to the term ‘post-conflict’ itself and what it really entails. For example, how does it extend beyond the cessation of armed conflict? How do governing bodies support residual hurt and tensions? Who are the grassroots organisations working in Catholic and Protestant areas? Have levels of inter-communal relationships improved, and if so, how are these quantified? These questions are in fact intrinsic to my line of work; in order to craft informed and impartial stories, I should be aware of the struggles of transitioning from a state of prolonged conflict to that of a peaceful society. To this end, the course provided a renewed appreciation of the day-to-day processes of a functioning and thriving community that we often take for granted. In addition to answering these questions, the course speakers covered a wide spectrum of topics that are not directly related to my everyday work. With that said, it was the inclusion of these broader elements including police reform, community-based restorative interventions, and transitional justice that really stimulated conversation over the course of the week. The course participants also had the chance to step outside the confines of the classroom to take a tour around Belfast city to view the ‘peace wall’ dividing the Shankill Road (Protestant) from the Falls Road (Catholic) – a stark reminder of the physical lines of division that still remain. Throughout the city, walls take on many forms – some are tall and ominous, whilst others blend purposely into local residential areas. 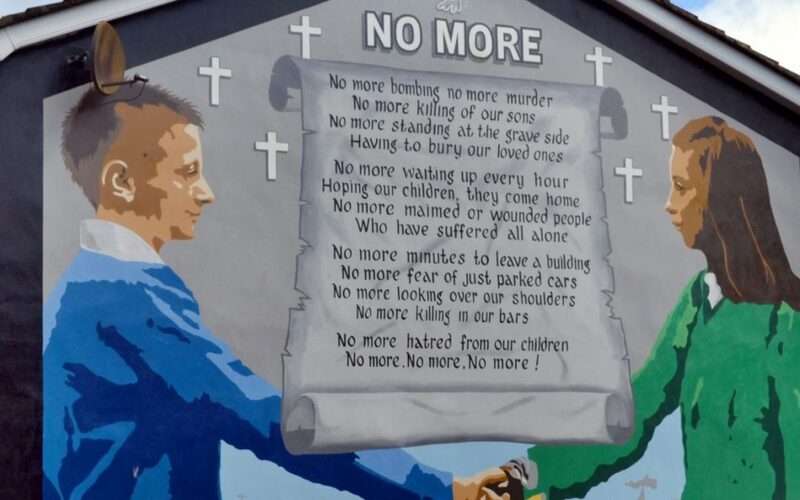 In total there are approximately 100 divisive structures littered across the city’s diverse fabric of communities; more walls (including an array of defensive structures) have been built since the Good Friday Agreement was signed in 1998 than ever before. This reality is indicative of an ingrained pattern of segregation and rife sectarianism that continues to this day. Of particular interest were the discussions centred on the challenges of transitioning the Ulster Volunteer Force as well as the Republican perspectives on the transition of the Provisional Irish Republican Army. The speakers who addressed the group were released under the Good Friday Agreement and have since been reintegrated into society. This was an incredibly important lesson in terms of how relative the passing of time can be for those affected by conflict. Furthermore, a personal highlight of the course was the the Maze Long Kesh Documentary Project, a participatory storytelling initiative. This interactive documentary follows various people including former prisoners, relatives, prison guards, and lawyers as they walk through the old prison that once housed many Republican and Loyalist paramilitary offenders. Some approach the prison composed but with considerable trepidation, whilst others break down as harrowing memories come flooding back. This creative yet simple approach manages to effectively capture the legacy of the prison, whilst also sharing the various perspectives of Northern Ireland’s violent and traumatic conflict. Since I attended the course Brexit has unfolded, resulting in great uncertainty. I am aware of concerns within the Republic of Ireland, Northern Ireland and elsewhere in the United Kingdom. In short, nobody wishes to return to a hard border with passport controls; there is general agreement that this would be a huge backward step socially, economically, and even psychologically. Whilst Brexit has reignited the possibility of a referendum on the reunification of the island of Ireland, the question of a United Ireland remains a complex and fraught issue. Although we cannot foresee the long-term impact of Brexit, we do know that the Good Friday Agreement is working at present. To that end, it is imperative that we recognise the fragility of the peace process if we are to ensure it not only continues, but thrives.